A VIP restroom in the portable restroom world is the restroom trailer. A restroom trailer, as its name suggests, is a larger bathroom solution that still remains portable. These bathrooms benefit from their larger size and more expansive list of features and amenities. Your event goers will appreciate the added elegance and functionality of your restroom trailer. Ones step inside and they will completely forget their inside a porta potty! While there’s still a special place in our heart for more traditional portable restroom solutions, porta potties at professional events stand in contrast to the formal environments they become a part of. Incoming Inclement Weather? No Problem! Depending on which portable restroom trailer solution you choose – these trailers can offer more room and toilets to accommodate a larger number of guests. VIP restrooms are also cleaner than other porta potties. This is because the space is more like that of a bathroom in your home where flat surfaces are available and the floor is more expansive. 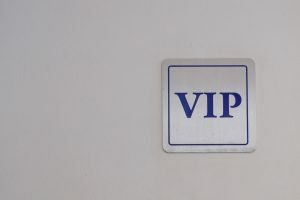 To read more about our VIP Restroom Trailers, visit our dedicated page here where you can place an order for your event and view more pictures.